CORK, Ireland (January 5, 2012) - Irish boxing manager Gary Hyde announced today that he has come to an agreement with "Irish" Micky Ward to train his hot prospect, light welterweight sensation Levan "The Wolf" Ghvamichava. Ghvamichava (6-0, 5 KOs), who is a native of Georgia living in Belfast, will relocate in February to Lowell, Massachusetts, where he will train under the guidance of three-time Fight of the Year participant, Ward, whose life was portrayed in the Academy Award winning movie, The Fighter. "I am delighted we have Micky Ward on board," Hyde said. "He has a lot of valuable experience to share with Levan, whose style of fighting is very similar to Micky's. 'The Wolf' is a throwback fighter who loves nothing more than going into the trenches, just like his new coach, and fighting toe-to-toe. Micky has been approached by a lot of fighters who wanted the benefit of his coaching and experience, so I am very happy that Micky has chosen to work with us. "Levan is a six-time Georgian Senior champion, European silver medalist, and one of the leading 140-pound division amateur fighters in the world the past few years. I have been in talks with some of the leading promoters in the United States who are very keen on signing Levan. When he makes his US debut, sometime fairly soon, he could be fighting on a major undercard." In 2011, Ghvamichava won all six of his pro fights and he is already fighting in scheduled eight-round bouts. 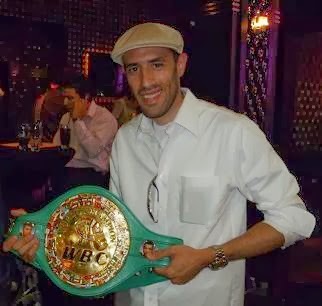 Levan is one of the highest ranking fighters in the world for a fighter with relatively so little pro fights. In his last fight this past October in Scotland, he knocked out former European and Italian champion Guiuseppe Lauri (51-8, 32 KOs) in the second round. "I'm looking forward to working with Levan and Gary," the popular Ward commented. "Levan looks like a talented fighter with a very, very bright future. We'll get him good sparring at my gym (Chelmsford, MA), as well as the West End Gym in Lowell, and also take him to some gyms in Boston. There are a lot of young fighters around here who will be good sparring partners for Levan. I can't wait to get started." Hyde, president of Nowhere To Hyde, also manages a stable of other undefeated fighters such as WBA Interim Super Bantamweight Champion Guillermo "The Jackal" Rigondeaux (8-0, 6 KOs), undefeated British welterweight prospect Mark Heffron (5-0, 4 KOs) and light middleweight Dee "Wealthy" Walsh (1-0). Hyde plans to sign more fighters in 2012 and make Lowell his U.S. base. Best of luck to Mickey and the Wolf pup. If you can condition and teach the quick hook to the liver , the sky is the limit! Great news. Jim D.